30 Years of Walford Mill Crafts, Wimborne. 19th March until 22nd May. 40 makers with strong links to the Mill celebrating its 30 years of consistent promotion of high quality crafts both locally and nationally. 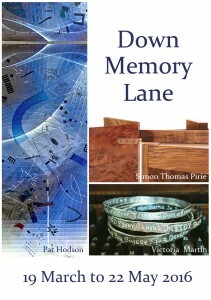 Makers include John Makepeace, Matthew Burt, Alan Wallwork, Frances Hatch and many more. I was involved at board level for many years at Walford Mill, chairing the board it for two periods over a decade. I’ve also taken part in shows at the Mill since 1998 and even co-curated a furniture show there with Christine Fletcher-Jones in 2009. It’s a long standing relationship which I’m proud to be associated with! Our stunning walnut & burr walnut drinks cabinet is being exhibited during ‘Down Memory Lane’. For more details and opening times please visit the Walford Mill Crafts website. ‘Inspired 2016’ is the fourth collaborative selling exhibition between the Festival of Silver, the Furniture Makers’ Company and John Higgins Contemporary Silver. The Goldsmiths’ Centre will once again host this impressive exhibition of the UK’s finest silversmiths and bespoke furniture makers. On display will be the work of 80 of the finest UK silversmiths, including Rod Kelly and Hiroshi Suzuki, as well as the monumental work of Thalen & Thalen from Belgium and the innovative silversmithing of Lasse Baerhing from Denmark. Also showing will be 15 of the UK’s finest bespoke furniture makers including world renowned John Makepeace; and other prominent holders of the Furniture Makers’ Company’s prestigious bespoke Guild Mark, awarded for excellence in design and craftsmanship. 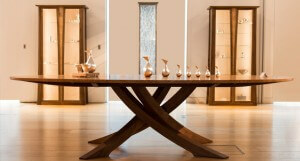 We will be exhibiting a pair of our stunning pivot drawer console tables, this time in native ash. It’s our second appearance at Inspired, the above image showing our ‘Ascot Display Cabinets’ in the background behind a striking Waywood dining table. For more information about Inspired including opening times click here. It’s the build up to Chelsea Flower Show and our collaboration with Sitting Spiritually on garden swing seats and benches sees the Simon Thomas Pirie Contemporary Range officially launched at RHS Chelsea this year. 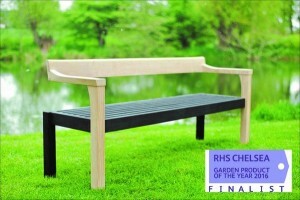 The new Yakisugi Swing Seat and Floating Bench will be on the Sitting Spiritually stand (RHW369), with the Floating Bench also featured on the ‘RHS Chelsea Garden Product of the Year’ finalists stand. 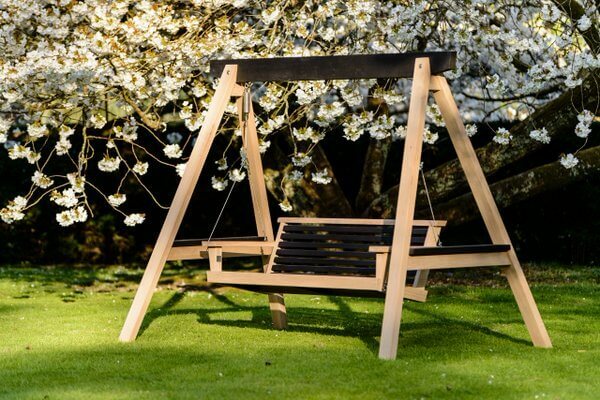 And we have just had more exciting news with the confirmation that the Yakisugi Swing Seat will be featured in the Jardin Blanc at Chelsea Flower Show. Jardin Blanc is the exclusive restaurant and hospitality area run by Raymond Blanc at the heart of this year’s Chelsea Flower Show experience. It has been a great start to the launch with lots of press attention, we have already been featured in the Sunday Times Homes supplement, The RHS Magazine, Woman and Home, Society of Garden Designers Magazine and Gardens Illustrated. We all can’t wait to see what the public reaction will be like during Chelsea. Make sure you visit Martin Young and the team from Sitting Spiritually who will be there throughout the show on stand RHW369, we will be joining them on the 24th for a Chelsea ‘day out’. Can’t wait to sup up some of this prestigious event’s atmosphere. For more details about Chelsea Flower Show opening times and how to get there click here. For more detail about the Sitting Spiritually / Simon Thomas Pirie Contemporary Range visit the Sitting Spiritually website. Probably the greatest free festival of artists and makers in the UK. This year we are one of 300 studios and workshops opening their doors to the public for all 16 days of DAW 2016. Joining us at the Courtyard Gallery & Workshop are the painter Frank Finn and the silversmith Karina Gill, both very highly regarded artists in their own fields. We are also very lucky to be right next door to the talented acrylic & watercolour artist Marilyn Allis whose studio (venue 47) is also open during DAW. Karina Gill’s striking etched metal bowls and jewellery are influenced by colour, texture and repetition. 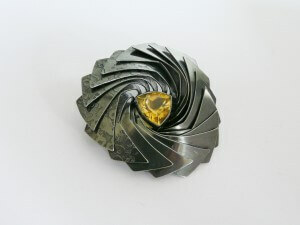 Her organic and geometric forms are hammered and manipulated by hand in silver, steel, copper and brass. Karina has expanded her range in silver, working on much larger scale sculptural bowls for interiors. Karina’s work is the perfect visual compliment to Simon’s furniture. Many of Frank Finn’s paintings explore the rhythmic tensions across land and sea. Other, non-figurative works research fundamental dynamics within the picture frame and the balance between informal and structured shapes. 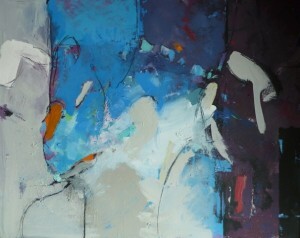 Frank Finn has been a trustee for Dorset Visual Arts and has frequently exhibited in Dorset Art Weeks, but this is the first time Frank’s work has been shown at the Courtyard Gallery. As well as our dining furniture, occasional tables, cabinets and the Simon Thomas Pirie Contemporary Garden Range we have developed for Sitting Spiritually, there will be plenty of ‘work in progress’ going through the workshops including some of our larger projects like kitchens. We also plan to be steam bending throughout DAW – watch this blog and our social media for times and dates. The joy of an open workshop event like this is that we are always here to talk to – whether it’s just to answer a simple question or have an in depth discussion about a potential commission. 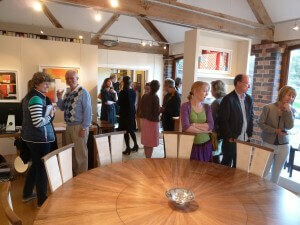 The workshop and gallery is open every day throughout the event from 10am till 5pm. Follow signs for Briantspuddle off the A35 2 miles west of Bere Regis, then keep following the red and yellow DAW venue signs 46/47 on to Rogers Hill Farm. To search through the directory of 300 venues click here. The free 160 page full colour Dorset Art Weeks brochures can be found throughout Dorset in pubs, galleries, libraries, and tourist information centres.